View More In Family Camping Tents. The Timberridge WF141080TU family dome tent is a great choice for large families and groups. Two large Dutch ""D"" style doors are ideal for easy entry and exit. 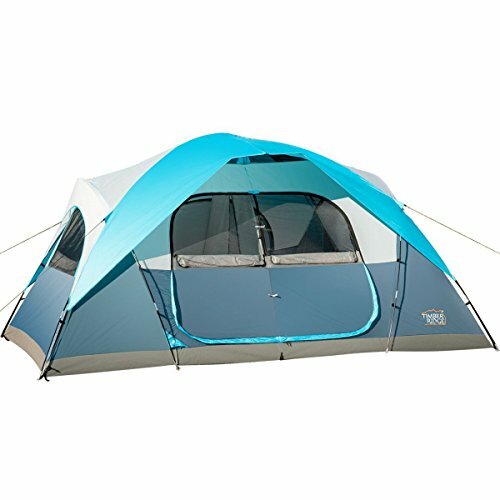 High strength fiberglass frame with pole pockets makes sure for easy setup and stability, which surely makes any camping trip a better experience. Fixing hooks are very convenient. The mash body is perfect for ventilation and bug free environment. Enjoy high density fly frame for additional stability. You can even divide the Grand Pass into two rooms to enjoy added privacy. Gear organizer gives more storage space than normal style tent. Special design is convenient for Solar energy charging system. Moreover, it comes with its own carry bag which is great for storage and transport. If you have any questions about this product by Timber Ridge, contact us by completing and submitting the form below. If you are looking for a specif part number, please include it with your message.